Synopsis: One choice can transform you. Pass initiation. Do not fail… Thrilling urban dystopian fiction debut from exciting young author.In sixteen-year-old Beatrice Prior’s world, society is divided into five factions – Abnegation (the selfless), Candor (the honest), Dauntless (the brave), Amity (the peaceful), and Erudite (the intelligent) – each dedicated to the cultivation of a particular virtue, in the attempt to form a “perfect society.” At the age of sixteen, teens must choose the faction to which they will devote their lives. On her Choosing Day, Beatrice renames herself Tris, rejects her family’s group, and chooses another faction. After surviving a brutal initiation, Tris finds romance with a super-hot boy, but also discovers unrest and growing conflict in their seemingly “perfect society.” To survive and save those they love, they must use their strengths to uncover the truths about their identities, their families, and the order of their society itself. In the past few years, with the publication of the hugely popular The Hunger Games, more and more YA dystopian novels are being released by publishers who want to ride the wave of the success of The Hunger Games much like they continue to publish dark/paranormal romance in excess. As is to be expected, not all are good; in fact, the majority don’t offer anything new to the genre. I should probably now guiltily mention that my YA dystopia experience is minimal (I haven’t even read The Hunger Games. There, I said it!) and as such, I might not quite offer the insight that someone who is widely read in the dystopian genre would, but hopefully this review will be insightful and helpful anyway. To sum Divergent up, it is one long initiation trial for Beatrice. Beatrice must endure the oft grueling trials placed before her so she doesn’t become factionless and does live a life worth living. But what is meant to be Utopia isn’t all it seems, and the core concepts that kept the city from war crumble under the strain of human flaws. I was told Divergent was an in-one-session read. It was, were it not necessary for me to sleep and go to school. I read the full 490-odd pages in just about 24hours. One thing that has to be said is that Divergent is incredibly exciting, and manages to thrill in all the right places. It has plenty of action, which drives the story on with a stamina that is normally quite rare. Veronica Roth’s prose certainly helps. It is fluid and manages to hold all the action together well, while still making the calmer scenes an interesting read. The synopsis of Divergent mentions an ‘unexpected romance’. It’s romantic, but it sure as hell ain’t unexpected- from the word go I knew what would happen. 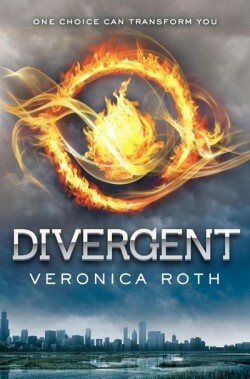 Much of Divergent follows in this pattern: it wasn’t all as unexpected and shocking as it would like to be, and it wasn’t hard to hazard a guess at what the culmination of the novel was (although the way it is carried out is unexpected). Oddly enough, I wasn’t too bothered. I greatly enjoyed the blossoming and somewhat unusual romance, and the action sequences held Divergent together in a way that kept it an enjoyable read. What did bother me; though, is the unsubtle and repetitive way Veronica Roth goes about explaining certain things, seemingly as if we didn’t get it the first time, when in reality we got it way before she spelled it out on the page. I enjoyed the characters. I enjoyed the tensions and flaws most of them had. What I didn’t enjoy was that the main antagonists had little depth. They were just cruel, which certainly made me hate them but didn’t improve their two-dimensionality. Divergent – riding the success of The Hunger Games? Certainly. But that’s not necessarily a bad thing. Plenty of great novels never get published because they aren’t believed to be sellers. Divergent may be predictable at times, but the well-written action and the sometimes-scary scenes manage to move the novel forward successfully. Divergent is compelling. It has some good characters and an interesting romance. It is noticeably a debut novel and Veronica Roth shows great promise. If she manages to build on this firm foundation, the series will be one to look out for. What did you think about Divergent? Great review! I really need to get a copy of this soon, everybody’s been raving about it! Make sure you check out The Hunger Games soon, dystopia’s becoming really popular in the book world, and THG is at the top. GREAT REVIEW! I am so excited for the novel. I’ve had it pre-ordered for month. This just adds fuel to the fire of excitement.